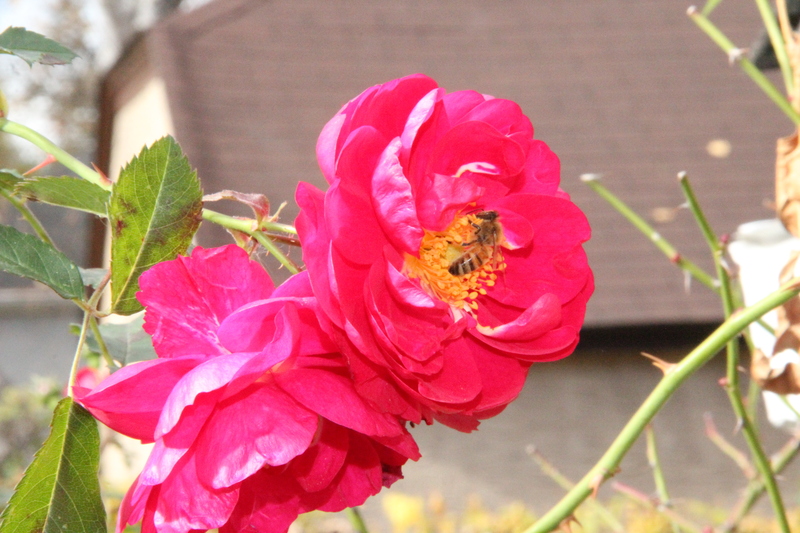 A honey bee visits a ‘Henry Kelsey’ rose in early November. Under the gentle, midday sun, I walked through scads of scarlet maple, golden aspen and lemon-colored apple leaves that dot our cleaned up garden. I heard a steady buzzing and followed it to a group of buds and blossoms on the climbing rose that grows on our garage. Among the roses floated a single honey bee (Apis mellifera), as leisurely as if it had been a sultry August afternoon, instead of early November. The golden bee rolled in the pollen of each rose before heading skyward. I miss my small garden so much during the winter. Seeing and hearing that tiny creature brought me great joy — the simple beauty of bee and blossom, the presence of life in the November garden, and a wonderful image to remember when winter inevitably arrives. What Happens to Honey Bees in the Winter? Do Honey Bees Fly South for the Winter? This entry was posted in Autumn, Backyard Nature, Garden, Honey Bees, Joy, Phenology, Saint Paul, MN and tagged Apis mellifera, Rose x 'Henry Kelsey'. Bookmark the permalink.